Now that we are safely in the New Year (2010), I need to catch up on my chronicles of top memories from the preceding 2 months. I’ll start with November. 5. 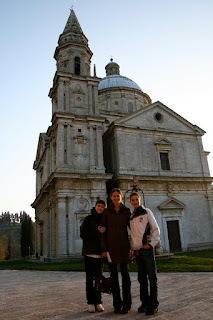 A day trip to Montefiascone and Pienza. We had an out of town soccer game in Acquaviva and decided to take advantage the remainder of the day to explore two neighboring cities: Montefiascone and Pienza. We were particularly lucky to arrive at Montefiascone in the mid-afternoon when San Biagio was still open. A high-renaissance pilgrimage church, situated below the city at the end of a Cyprus tree-lined drive, San Biagio is one of my favorite churches in all of Italy. The church boasts a Greek-cross plan and a simple, stark interior (highlighting the altar and a few pieces of art). It was lovely. We trekked into Montefiascone’s city center, walking along the “spine” of the hilltop, arriving at the main piazza and an old castle (converted into a park). We sampled wines at a local vinoteca (and bought some to go) – it was delightful. Thereafter, we made our way to Pienza, arriving just in time for the “passegiata”. The city was filled with locals, walking down the main corso, babies dressed and on display, and all the shops were flooded. The artisanal pecorino cheeses were out and available for sampling – splendid! Pienza is famous for its Pecorino (and rightly so) – many of the cheese-wheels were aged in hay, chestnuts, sunflower seeds, rosemary or other local scents and flavors (imbuing a unique flavor to the cheese). Hard to describe; I suggest doing it yourself! Read more. 4. A day trip to Castellina in Chianti, Panzano and Several Wineries. Probably one of the loveliest days in Italy thus far was a day trip that Janelle and I took to Castellina in Chianti (while the kids were at school). Whenever going out for wine tastings, we’ve learned to initially drive to the furthest destination, and then meander your way back home. Janelle conveniently had a meeting in Chianti (for some freelance travel writing; an impetus for the trip). After her meeting, we briefly explored the town, including a beautiful ceramic shop and a couple of tasting rooms. We also made our way up the hillside to some Etruscan tombs (yippee!). Thereafter, we drove through the Chianti region stopping at several wineries along the way (Castellina, Poggio Amorelli, Fantodi and Panzano). The most impressive, by far, were Fantodi (a major winery in Chianti with loads of accolades) and Poggio Amorelli (a small family-owned winery, producing sub-25k cases annually). In addition to tasting several great wines, Janelle and I had a fantastic day just tootling about Chianti in a yellow Fiat Panda wherever our noses took us. And, we got lucky too – finding a family-owned olive orchard and frantoio at the end of our day (above Florence, outside Impruneta). We received a personal tour by the owner’s daughter, including a walk into the olive orchards, tastings and witnessing the harvest. Janelle detailed the entire adventure, but you must do it yourself – in November only. 3. Thanksgiving Dinner Prepared by Janelle. While being overseas is a fantastic experience for our entire family, traditional holidays and events are difficult to miss. Unlike Christmas, Thanksgiving day is not recognized in Italy (no surprise, then again in America we don’t celebrate the Feast of the Epiphany with a day off from work). Janelle made up for it with her own efforts to recreate Thanksgiving in Florence. She could not find a “whole” turkey to purchase, but did manage to find 2 huge turkey legs and breasts. She assembled them together with stuffing in a manner that resembled an entire turkey. It was great! More importantly, Janelle also prepared many of the traditional accoutrements (cranberry sauce, potatoes, apple pie, etc. ), which satisfied all our nostalgia for Thanksgiving. The entire meal was delicious, and in many ways, I think each one of us were more thankful for the United States this year, than in years past. 2. A Bologna weekend trip. We took advantage of a weekend “off” from soccer and visited Florence’s major rival and neighbor to the north: Bologna. Whereas Florence is known for its wealth of great art, scientists, philosophers and politicians, Bologna is known primarily for its food. Referred to as “la citta di grasso” (the City of the Fat), Bologna did not disappoint our gastronomic quests. Read more. However, the joy of this trip was not limited to restaurants, but also encompassed the journey and our explorations as well. En route to Bologna from Florence, we simply set the GPS on “avoid highways” and stuck entirely to back roads (including gravel roads too!). We tried to follow along on the map, but we were soon off track and simply trusting the latest in satellite technology to navigate us to our destination. Along the way we went through the source for “Panna” water, discovered embattlements from World War II (foxholes and gun mounts still stand just a 100 meters off the road), and we were dazzled by spectacular views. After arriving in Bologna and settling into our hotel (a disappointment), we were soon wandering about the city and its myriad of arcades. Bologna was decked out in preparation for advent, a holiday festival has been set up in city center (including an ice rink), and the streets were filled. After dinner we strolled back to our hotel (almost rolling after 4 courses), and then slept off gastronomic delight before embarking in the morning to further explore the city. Like Pisa, Bologna offers its own version of a leaning tower (2 in fact); one of which we climbed (485 steps). Altogether, a weekend in Bologna was not enough time – I wish we had a week to eat, shop and further explore the city. I strongly recommend it if you are eager to uncover culinary delights or want to see a real Italian city without the tourists. Read more. 1. A day trip to Orvieto. The most memorable family experience in November was surely our day trip to Orvieto. I had previously stayed in Orvieto as a college student almost 20 years prior and loved it. My family similarly fell in love with the city. Arriving in Orvieto by train from Florence, we trekked on foot up the original path to the city (from the valley below). Thankfully my entire family is gung ho, because soon we were traipsing through the bush on an old cart path, below the imposing 200-300ft cliffs/walls of Orvieto. It was a dramatic experience and well-intended for my kids to understand just how difficult and impenetrable this city was during the middle ages. The weather held off and we made our way up and through a succession of the city gates, stopping at each one to study where the archers, gates (hinges still present) stood, and buckets of tar and boiling water were dumped on attackers. Cool! Finally arriving at the top of hilltop, my family was stunned by the magnificent views afforded from the old castle (now park). We walked the walls, explored the S. Pietro Pozzi well (dug into solid rock!) and then made our way up and into the city. Notwithstanding its small size, Orvieto has a great variety of shops and artisans (including ceramics). The crown jewel of Orvieto is its cathedral; a magnificent gothic church evidencing an Arab-Norman influence (striped black and white courses) and boasting the most stunning façade in Europe (a jeweled mosaic of gold, lapis lazuli and other precious gem stones). The church was built to celebrate the feast of Corpus Christi, including a shrine holding the famed altar cloth where the Eucharist was said to have bled in front of the congregants (at Bolsena). Regardless of your faith, if you appreciate church architecture, the Duomo of Orvieto is a must-see. Afterwards we walked around the far side of Orvieto, further exploring city walls and its embattlements. At the end of our day, we made our way down the corso and stopped by a family-owned pizzeria for dinner (prior to embarking on our return journey to Florence). Altogether the day was fantastic, but too short. We intend to revisit when family comes to Italy. Read more. Other honorable mentions from the month of November include the following: going to olive oil tastings almost every weekend in November in the piazzas of Florence; touring Museo del Duomo and seeing a Michelangelo pieta; visiting private Florentine gardens; touring the Laurentian Library and Medici Chapel; discovering Esselunga online (home grocer delivery in Florence); enjoying a private tour and visit at Castell Verazzano; going on a "secret passages" tour of Palazzo Vecchio; watching soccer games all over Tuscany; and the arrival of “lights” in preparation for Advent. By the end of November, Florence had transformed from Fall to Winter. The cold and darkness set in, and the rains increased, but Florence came alive in anticipation of Christmas. On the last weekend of November, the first Sunday of Advent was celebrated and city was awash in lights down every corso – the nights became magical. The passegiata took on new meaning and we experienced the warmth of Florence in an unexpected way. Bologna: Lights, Porticoes, Food, and Towers.